Wild Spirit Allstars Community Cheerleading Club. Wild Spirit Allstars Community Cheerleading Club provides cheerleading activities for young people age 3-25 years and over including dance, cheers, tumbling, gymnastics and stunting. 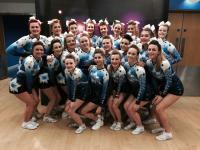 The club is run by qualified and experienced staff who are members of the UK Cheerleading Association and BCA. The club performs at competitions, for charities ans at community events. We have a full sprung floor, tumble track and dance floor. No experience needed as all skills are taught at a pace to suit the individual. Cheerleading builds confidence, self esteem, promotes team work and is an excellent way to keep fit whilst having fun! We look forward to meeting you at our new venue next to Parkgate in Rotherham. under fives 10 to 11.30am every Sunday, youth team 10 to 12.30, Juniors 10 to 1pm, senior level 4, (experienced athletes) 12 to 3, senior level 1, beginners and limited experience 2-5 Costs include between one and three hours training per week and entry fees for 3 annual competitions. In essence we are a Sheffield club who have trained in Sheffield for the past ten years, we have recently moved to an excellent facility with fantastic equipment in Rotherham.